Samothraki (Samothrace) Island, Thraki, Thrace, Hotels Apartments Greece, Holiday Guide Greece. Samothraki, an island of the northern Aegean, Samothraki is located opposite the gulf of Saros. It is mostly mountainous; it is covered by Mt Saros whose peak Fengari (moon) reaches an altitude of 1,600 metres, which is the highest peak on any island, Crete and Euboea apart. 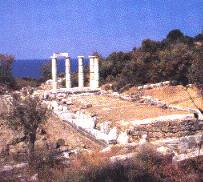 Samothrace has a Mediterranean climate with mild winters and fairly cool summers. The smooth coastline forms four capes: Akrotiri, Malathria or Megalo Akrotiri, Angisto and Kipo. Samothraki was especially important in antiquity because of the Cabeirian mysteries held in the Sanctuary of the Great Gods. Today, near Paleopoli where the famous Victory of Samothrace (Louvre Museum) was found, one can see the ruins of the Sanctuary, the Tholos of Arsinoe, the Arcade, the Temenos, the palace, the theatre, etc. Samothraki or Hora is the capital of the island. It is a charming village in the traditional style built in the island's interior. Small picturesque villages, abundant physical beauty, forest coupled with Mediterranean vegetation and running water, and the virgin shores, compose a specially impressive landscape is the "refuge" of many nature lovers. >> Thrace : Evros, Rodopi, Samothraki Island, Xanthi.